The full enemy cast revealed in an image! It was important to tie their visual design together with shared elements such as their central power core, leg, and wing design so they appeared as if they are part of the same family. Each enemy was given a unique silhouette as well as a emmisive light array so they would be distinct even in the shadow side of the ring. 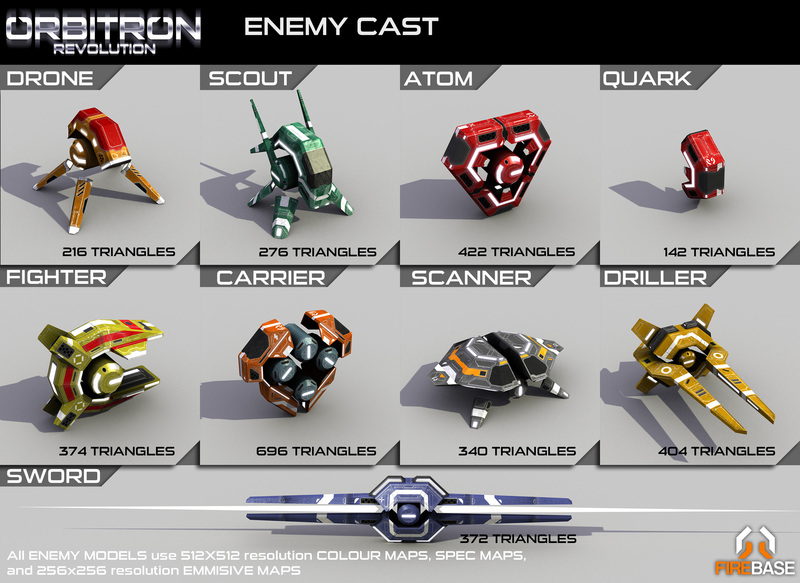 While low poly individually, the enemies appear in vast numbers. More than a dozen will appear onscreen at once and far more can be found tracking around the Orbitron Ring in frantic play sessions. We decided against using Normal Maps for their panelling and mechanical details as they didn’t seem to require the technique at the distance they appear at during gameplay. Off to Seattle for Gamefest!